Determining if your extinguishers are compliant can be confusing. Fear not, here’s the breakdown to clarify the basics. Not all extinguishers are created equal. Extinguishers serve different purposes. You may have noticed letters and color codes on your equipment. What does it all mean? More importantly, are your extinguishers the best choice for the area they are serving? The first step is to survey the location in question. Peek into your crystal ball and inventory all potential hazards. Note substances or equipment that will burn. This information will determine the classification of extinguisher you will need. Extinguishers are classified based on the hazard type. Classifications are A, B, C, D, K.
ABC is the most commonly used extinguisher and will serve most areas well. In certain instances however, an ABC extinguisher is insufficient. These cases may require a less common classification such as a D or K. In ever rarer cases, a more specific extinguisher may be required, i.e. 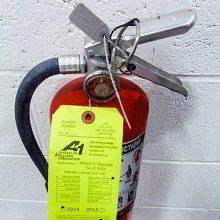 a magnetic area requires a non-conductive extinguisher. The second step is to inventory your equipment and surroundings. Extinguishers hold different suppression agents—some of which leave moisture or a mess. You wouldn’t put a foam extinguisher in a data room. The foam would destroy the servers in the process of smothering the fire. On the other hand, a carbon dioxide extinguisher would be ineffective in an outdoor area. One gust of wind and the fire would have enough oxygen to keep burning. Water-Only use these on class A fires. Honestly, in most cases a water extinguisher is probably not a smart investment. Dry Chemical-These work great for A, B, and C class fires. They leave a non-flammable substance behind to keep the fire from reigniting. They will make a mess so avoid using these in data rooms or computer labs. Carbon Dioxide-Use these on B or C fires. They are great for extinguishing electronics without harming them, and leave no mess. They are not as effective for the outdoors. The extinguishers listed above are not the only ones available, and you may be in a position to have a more robust extinguisher on site. If you need an extinguisher professional now, you can connect to one here. If your equipment is up to code, you’ll probably need to be trained to use the equipment. Click here to learn about extinguisher training. A1 is a leading expert on the latest technology in life safety. 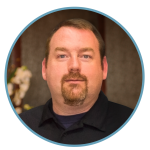 To find out more information or to ask a question, click here or call us at 1-800-859-6198. I didn’t know that there were different kinds of extinguishers until recently. I was looking for a new extinguisher and saw that they all had different letters. I later realized that it was showing what they were used for. I ended up getting the one with all of the categories to be sure that I had the right one in a situation. Thanks for the great information! It was good to know about the dry chemical type of fire extinguisher and that it is used on flammable items to keep them from reigniting. I have a feeling that this type will work well with flammable liquid, don’t you think? And since my brother is planning to start a business that is related to auto fuel and oils, I think he needs to consider getting this one. Thanks. I had no idea that there are different types of fire extinguishers. Knowing that there are extinguishers that are meant to stop fires from reigniting is important. My fiance and I will keep this in mind as we look into this appliance for our new home.